As Floridians, it’s important to realize that a natural disaster or other potential emergencies can occur at any time. Everyone should be prepared and develop an emergency plan, disaster kit, and know where to go if an evacuation is needed. Here are a few steps to take in order to be prepared if a disaster strikes. Create an emergency plan for your family, household pets and/or livestock. Your emergency plan should include; how you will receive emergency alerts and warnings, a plan for shelter, evacuation route, and a family communication plan. Understand what the emergency alerts and warning mean so that you can react accordingly. Locate nearby emergency shelters that will take in you and your household pets if needed. Create an evacuation route and where to meet your family outside of the home. Discuss with your family members how you plan on communicating with each other, especially if you are not together when the disaster occurs. Collect important documents such as birth certificates, passports, insurance papers, bank account documents, emergency contact information, and a household inventory list. Place documents in waterproof/ fire safe containers. If possible, make digital copies or keep copies away from the home, perhaps in a safe deposit box. Stock up on at least a 3-5 day supply of water and non-perishable food items. Assume that each person or pet will utilize at least one gallon of water per day. Select non-perishable food items your family will consume. Those items may include: dry cereal, peanut butter, dried fruit, ready-to-eat canned meats, fruits or vegetables, and non-perishable milk. Don’t forget to include food for infants such as formula, those with special needs, dietary restrictions, and household pets. 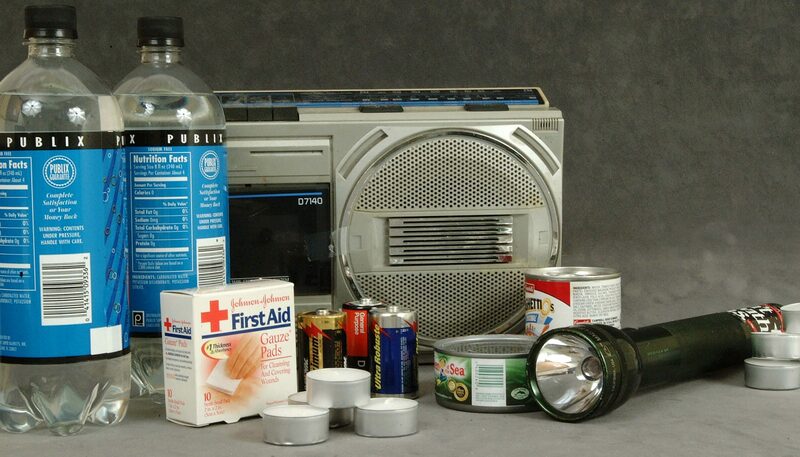 Gather supplies needed for your disaster kit. Pack at least 1-2 sets of clothing and shoes for each person. Secure sleeping bags or extra blankets and bedding. Purchase disposable cleaning cloths, hand sanitizer, soap, toothpaste, toothbrushes, sanitary napkins, diapers and any other personal hygiene products that your family may need. Include a first aid kit and manual. Be able to locate a battery-powered radio, flashlight and additional batteries. Water purification agents such as chlorine bleach or iodine tables should be added to your disaster kit as well. Gather all prescription medications, extra eyeglasses/contacts, dentures and cleaning solution, and medical support equipment. Before a disaster occurs, inform authorities about any special needs, i.e., the elderly, those with disabilities, or bedridden. Protect your home from potential hazards. Learn how to turn off the electricity, gas, and water. Buy a fire extinguisher and read the manual to understand how to operate one properly. Install smoke detectors and test frequently to insure functionality. Secure items that can shift or fall, such as heavy furniture and large appliances. Once you have established an emergency plan, make sure to practice it especially with younger children. We never know when a disaster will occur, but we should always be prepared just in case. For more information about disaster planning, access The Disaster Handbook or contact your local emergency management organization. Where is the emergency shelters for people who live off of Dead River RD, in Tavares. Here are the locations of the emergency shelters in Lake County https://www.lakecountyfl.gov/pdfs/Public_Safety/Emergency_Management/Risk_Shelters_for_Public_2018.pdf. Please visit the Lake County Office of Emergency Management for more information https://www.lakecountyfl.gov/offices/emergency_management/. According to the Lake County Public Shelter Registry, all of Lake County’s primary shelters accept pets. Pets must be brought in a carrier that is marked with the owner’s name, address and two phone numbers. Owners must have documentation of up-to-date rabies vaccinations for their pets. Owners are responsible for taking care of their pets. It is recommended pet owners bring minimal pet supplies, such as food and water, to a County public shelter.